Mural in Newark, New Jersey, celebrates imagination. Created as part of the mayor’s Model Neighborhood Initiative. Sarah van Gelder wrote this article for YES! Magazine. 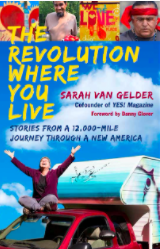 Sarah is a co-founder and columnist at YES!, founder of PeoplesHub, and author of “The Revolution Where You Live: Stories from a 12,000-Mile Journey Through a New America.” Contact her here, and follow her on Twitter @sarahvangelder. Connecting with and recognizing other #precariouslives as common ground with our own is a start. Then what? This! Dreaming and radical imagination.